When traveling with my iPhone 3GS, I find myself using up battery charge much more quickly than while at home. Whether it’s the use of the GPS, entertaining myself browsing the web, playing games, or watching movies, I am always worried about whether I’ll have enough charge to make it through the rest of the day. 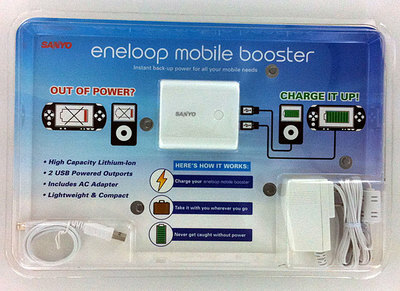 The Sanyo Eneloop Mobile Booster is a compact and inexpensive solution to my traveling battery issues. 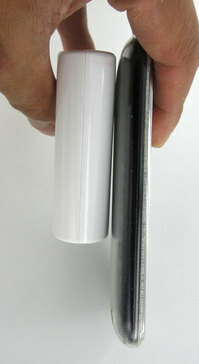 The Eneloop Mobile Booster is a 5000mAH Li-Ion battery pack that can recharge your iPhone 3GS a whopping four times! Right now, the Sanyo eneloop Mobile USB Booster for iPhone is being sold at Amazon for only $38.95. I think this is an amazing deal for something that anyone who travels with their iPhone shouldn’t be without. UPDATE Feb. 10, 2010: It looks like Sanyo discontinued this particular Eneloop charger. As an alternative you might try the ImaxPower IMP500 External Backup Battery 5000mAh white which has the same amount of charge as the Eneloop or the massive ImaxPower IMP880 iTouch External Backup Battery 8800mAh. 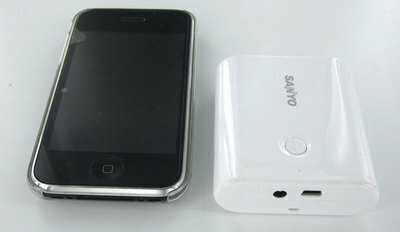 Here’s the size of the Eneloop Mobile Booster in comparison with the iPhone 3GS. It’s about twice the thickness, but compact.